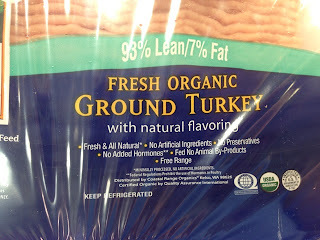 Cheap and Natural: Natural Flavors in My Turkey?!! I was at the store today and noticed they are now carrying organic ground turkey! YAY! Until I read the label: "organic ground turkey with natural flavors". Natural flavors?!! Really? Plain and simple turkey isn't good enough?! Regardless of whether or not you care about natural flavors in your meat, I want to stress how important it is to read labels. Find out where your food comes from and what they put in it. Just because it says "packed in the USA" or "distributed by ____" which has a domestic address, doesn't mean they didn't get the product from overseas. For example, a certain brand of "organic" nut bars sold at Costco are made with ingredients from China. It used to be that people ate from their own farms or local farms and knew the people who grew their food. Now, the food could be grown on another planet and people wouldn't have even noticed the difference! !